In a big mixing bowl, mix all the ingredients for the crepes and whisk all the ingredients to make a smooth batter. Let the batter rest in the fridge for 15-20 mins before you start making the crepes. Heat a non-stick pan on medium heat and add 1/2 tsp of oil to the pan. Pour about 1/2 cup crepe batter into the pan, swirling the pan slightly to make the crepe thin and smooth.Cook for 1 to 2 minutes or until bottom of crepe is light golden brown. Flip and cook for 30 seconds to 1 minute or until light golden brown. Transfer to a plate and repeat the step for rest of the batter. Heat a pan on medium heat and add the butter. As the butter melts, add the coco powder, powdered sugar , salt and milk and stir constantly. When the mixture comes to a boil. Remove from heat. 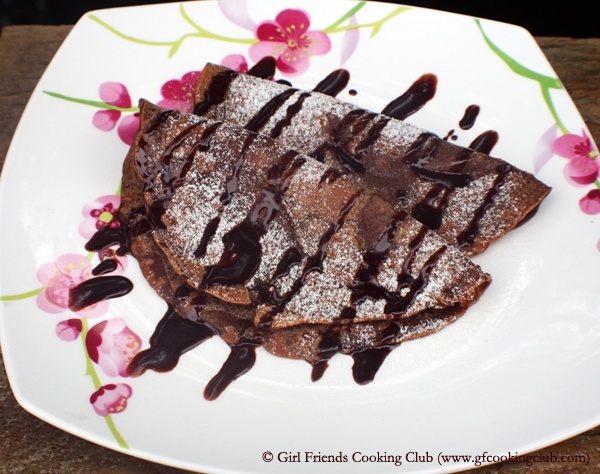 To serve, fold the crepes and place it on individual plates. Dust with powdered sugar and top with swirls of chocolate sauce. For a dessert : Fill the crepes with fresh strawberries and whipped cream and top with chocolate sauce. This entry was posted in Breads/Cakes/Rotis/Parathas, Desserts and tagged Chocolate Crepes by Kamakshi. Bookmark the permalink.